Photo credit: Paul Michael, StockFood. Mashed potatoes used to be the superstars of our Thanksgiving table, but lately it seems they have lost their luster. What happened to our favorite comfort food? Our guess is that there are about a million ways that mashed potatoes can be done wrong, so it’s pretty easy to get turned off of the stuff. Let’s be honest: Mashed potatoes can be watery, not fluffy enough, too dry, not seasoned properly, or just plain blah. Master the rules of perfect mashed potatoes now, and you’ll ensure that they’re at their buttery, fluffy best on your Thanksgiving table. 1. DO use the right potatoes. Not all tubers are created equal as far as mashed potatoes are concerned. Potatoes fall into three categories: starchy, waxy, and all-purpose. You want to use the starchy ones to get a creamy mash. We prefer Yukon golds for their buttery texture (and golden color), but Russets (aka Idaho potatoes) are also good. 2. DO cut your potatoes the same size. Different-sized chunks will cook at different rates, so some of your potatoes will be undercooked while others are overcooked. No bueno. Cut your chunks the same size, start them in cold water, and bring to a simmer until they are cooked through. 3. Do NOT add your flavorings at the end. There’s nothing worse than biting into a hunk of raw garlic because it was stirred in right before serving. We like to put garlic and herbs in the pot with the dairy, so the milk or cream gets infused with the flavor before being added to the potatoes. 4. DO embrace the tang factor. Sour cream, buttermilk, crème fraîche—all these things will do wonders for your spuds by adding richness as well as a pleasant tang. 5. Do NOT lose the fluff. There are a lot of things you can do to ensure your mashed potatoes are perfectly fluffy every time. One trick is to drain the potatoes and put them back in the pot without a lid after they have boiled. Cook them just for a couple minutes on medium-low, shaking the pot, until all the excess moisture that’s still clinging to the potatoes has evaporated. That’s liquid you DON’T want, since it’ll make your mash all watery. 6. Do NOT add cold liquid. Make sure the milk or cream you add to your potatoes is HOT. This helps it absorb better so you don’t feel the need to overmix. Overmixing is bad. Keep reading to see why. 7. Do NOT skimp on the seasoning. Salt the water you are cooking your potatoes in, just like you would pasta. Once your potatoes are mashed, season and taste until they are to your liking. All the butter in the universe can’t make up for the taste of bland potato. Oh, and don’t skimp on the butter either. Nobody likes a butter miser, especially on Thanksgiving. 8. DO use a potato masher or ricer. You do NOT want to use a food processor to mash the potatoes. Vigorous overmashing is a serious problem. Why? Because potatoes are made of starch and starch doesn’t like to be handled too much. Ever had gluey or gooey mashed potatoes? This is why. 9. Do NOT serve a naked mash. Mashed potatoes are perfect on their own, yes. Know what else is perfect? Topping them off with a pat of butter, a handful of crispy fried shallots, a sprinkling of chives, or a generous shaving of your favorite cheese. Gravy on the side, always. 10. DO wait until the last minute. Mashed potatoes are pretty time sensitive—they always taste best when freshly made, and they never taste as good when reheated. To make them fresh without messing with the rest of your Thanksgiving game, peel and cut the potatoes up to a day ahead and store, covered in water, in the refrigerator. 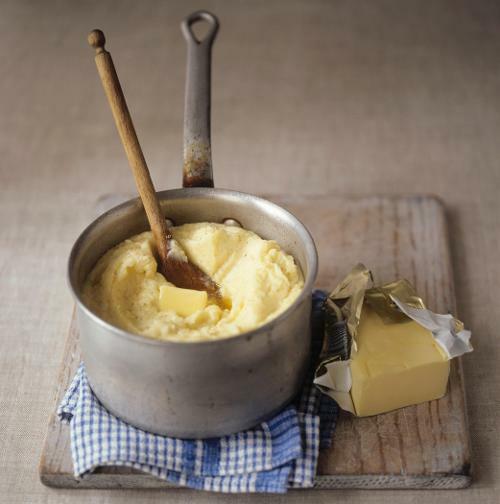 Assemble your milk/cream/butter mixture in a small saucepan and refrigerate that, too. That way, all you need to do on Thanksgiving day is boil, drain, and mash.